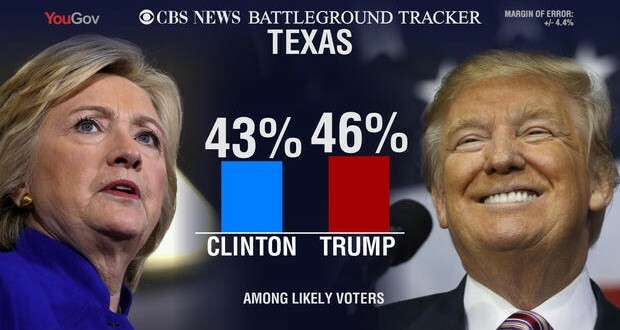 TEXAS: Trump +3, Hillary Within Margin Of Error - Joe.My.God. Hillary Clinton holds a three-point lead over Donald Trump in Florida, while in Texas – a state that has voted Republican by wide margins in recent years – Trump leads by a mere three points. The poll numbers show voters’ frustration about the dialogue in the race – and what may amount to a wasted opportunity for both. Sixty-nine percent feel Donald Trump is talking about things that he, himself cares about, while fewer, 46 percent say he’s talking about issues they care about. Clinton has much the same gap. And on one of those big topics Trump is talking about of late, Republicans in both places overwhelmingly echo Trump’s own expressed doubts about the validity of the election. They back him on the suggestion – raised at the debate this week and elsewhere – that he might not accept the outcome. More than eight in ten Florida and Texas Republicans and believe that fraud is widespread, and more than eight in ten of those who say there is fraud believe that without it, Donald Trump would win the presidency. So in total, 72 percent of all Florida Republicans believe Trump would win in November were it not for fraud.